Aloinopsis calcarea has such interesting leaf texture. Don’t they look like they could be lizard tongues?! Thanks for the comment & the inquiry. I don't quite know the climate and environmental conditions in central Florida, so I can't give you a real answer. But, I can say that here in coastal San Diego, they do well in dappled sun. 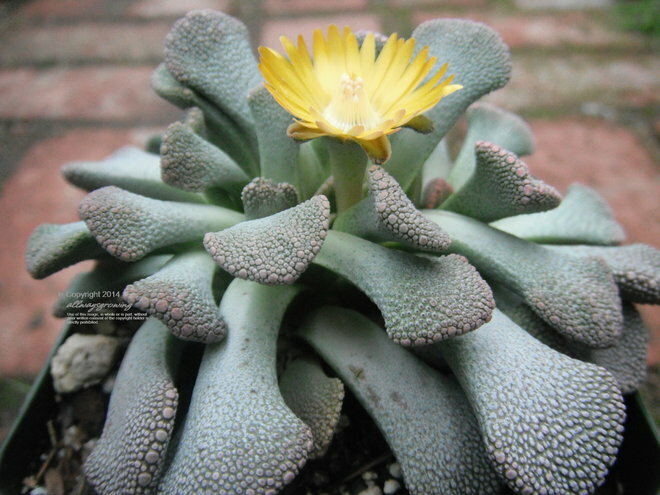 I believe they originate from South Africa, growing well in dry, rocky outcroppings. Because San Diego is closer to the equator (therefore stronger sun & higher temps), I try to compensate by giving mine a little protection from direct sun all day. As far as watering, I allow them to dry out between waterings, sometimes as much as 3 or 4 weeks in between. Hope this helps. I'm no pro, but I experiment & go with what works in my climate.